Having a sick child is devastating. Maintaining a large family while caring for a sick child can put anyone over the edge. 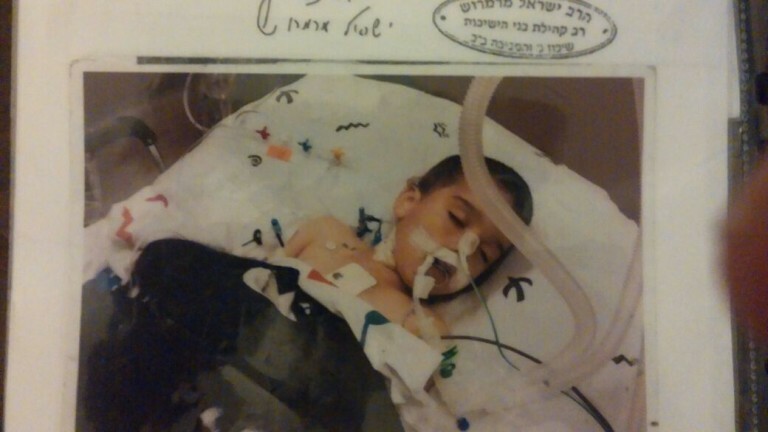 "When my son got sick and had surgery for a very serious heart condition, our world turned upside-down," Avraham Schneider (pseudonym) told Breaking Israel News. "I have never asked for help from anyone and here we were not able to pay our bills and not knowing from where help would arrive." Schneider, a teacher and the father of a large Israeli family, found himself knocking on doors begging for money. A dignified and pleasant looking man, it was clear that he was out of his element. "Following his surgery, my son needs round-the-clock supervision because it is dangerous for him to get sick or even to get a minor cut," he continued. "We had no choice but to have my wife leave her job to care for him. My salary alone is not nearly enough to maintain my family and we accrued many debts." Some luck came to the Schneider family when their landlord let them live rent-free for several months. However, the apartment they were renting was sold and the family was forced to relocate to Israel's northern city of Haifa. That challenge actually led to a blessing. Following morning prayers in synagogue, Schneider went around asking congregants for tzedakah. Tzedakah is generally translated as "charity". However, the Jewish concept for giving is different. The root of the word tzedakah is tzedek, which means "righteousness", while charity's etymological origin is from the Latin caritas, which means "affection". While in the Western world, giving charity is instigated by feelings of love or compassion, Biblically, giving tzedakah is fulfilling a Godly commandment, a mitzvah. Though it is best to donate with a loving and compassionate heart, even if one doesn't "feel" like giving, we are still obligated by God to offer a tithe of our earnings to those in need. This distinction is important as tzedakah is for the spiritual benefit of the giver as well as for the physical benefit of the receiver. "I was praying in synagogue with Avraham Schneider," Aryeh Weingarten, founder of Karmey Chesed, told Breaking Israel News. "I didn't know his life circumstances and he didn't know that I run Karmey Chesed, an organization run by dedicated volunteers that helps needy families with both their physical and emotional needs. He was clearly embarrassed to ask for money but he explained that he had no choice as he had a very sick child and another son about to have his Bar Mitzvah. There were just too many expenses." Through Karmey Chesed, Weingarten gave the Schneider family a large sum of money to help them pay off some debts and provide for their basic needs. "It is a miracle that we have gotten to know Aryeh and Karmey Chesed," Schneider shared with Breaking Israel News. "Karmey Chesed has tried to help us in every way it can. This organization is amazing." Schneider has done his best to shield his children from knowing that they being sustained through tzedakah. In this very difficult period in their lives, they have been given a ray of hope through the generosity of Karmey Chesed.